Gear up for February with our Valentine's Day-themed issue! 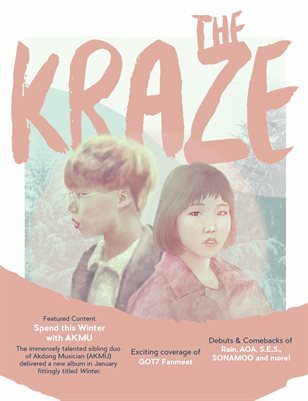 This month we feature the lovely duo of Akdong Musician, as well as present our usual round-up of comebacks. We've got reviews on legends RAIN and S.E.S as well on AOA and SONAMOO of the newer generation. Additionally, K.A.R.D features in our Hot Debut section, with Ravi and Suzy appearing in our solo debut coverage. Feel the love with our themed-content, found in our coverage of real life and K-Drama couples, couple fashion, date night makeup, V-Day themed Korean phrases, sweet Korean desserts, and a bit about Korean blood type compatibility theory. The issue is rounded out with our usual chart and event coverage, as well as a trending piece on DAY6's monthly release plan.